There Was a Caveman, from developer Aamatniekss, is a retro-styled action-platformer inspired by Castlevania, Ghouls ‘n Ghosts, and Shovel Knight. In a world of dinosaurs, one caveman finds himself alone, with his entire kind apparently killed. He must battle his way through deadly dinos and avoid traps on a quest to find a female caveman (cavewoman?) with which to repopulate the world. 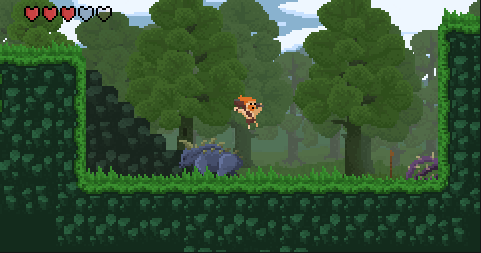 Fortunately, the loincloth-wearing hero is trained in the art of platformery as he jumps, double jumps, dashes, and swims through the world, occasionally encountering objects that may be hurled at enemies, including rocks and bones. Javelins may be thrown as well and then used as platforms, Völgarr the Viking-style. Of course, nothing conks better than the caveman’s trusty club. There Was a Caveman is headed to PC and Linux via Steam later this year.